Here is a quick and easy way for faculty to add office hours to their course schedule using MyCCRI. Once you have logged into MyCCRI, click on the For Faculty tab. The Faculty Services screen now appears with a list of selections. Click on Faculty Detail Schedule. 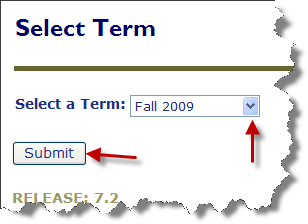 At the Select Term screen, select the current term from the drop down menu. Then click Submit. You should now be brought to your course list for the selected term. Scroll down to the course for which you wish to add office hours. Next to " Office Hours," click on Add . Scroll down to the Office Hours section and fill in the pertinent information, i.e. hours, days, phone #,etc. Note: When entering office hours, remember to use the 24 hour clock system. i.e. 8:00 a.m. to 9:00 a.m. should be entered in using four digits for each hour - 0800 to 0900. When you have finished filling in your information, click on the down arrow next to " Copy To: " and select the course(s) to distribute the office hours to. Note: Make sure that "Display" has been checked. Students will not see the posted hours if this has not been checked. Your office hours for the selected course are now available for students to see in their Student Detail Schedule and in your Faculty Detail Schedule.